The rogue regime of Venezuelan President Nicolas Maduro in Caracas has raised the ante against the U.S. and most Latin American states which had recognized Juan Guaidó. Guaidó, an opponent. Guaidó constitutionally assumed power under a provision which stipulates the President of the National Assembly takes up presidential powers on an interim basis when there is a question of the legitimacy of the presidential office. To prop up Maduro – and perhaps preventing him from fleeing — on March 23 Moscow landed two planes with some 100 soldiers in Caracas, ostensibly to service Venezuela ‘s Russian-made S-300 air defense systems. These were said to have been damaged in the recent frequent energy blackouts. 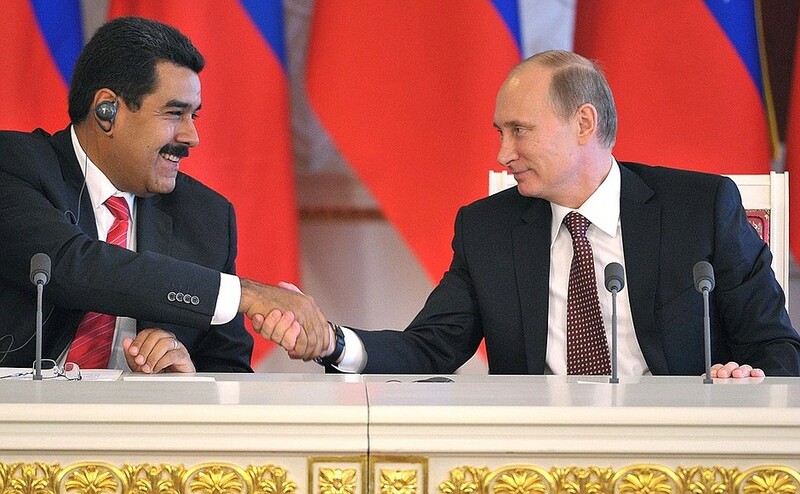 Russian military contractors and mercenaries were already believed to be providing security support for Maduro. Cuba’s secret police, too, a child modeled after the old Soviet KGB, has been helping set up a state security system in Caracas on its own allied with the Nicaraguans. Meanwhile, conditions in Venezuela have deteriorated radically under the Maduro regime. There has been a flight of refugees, as many as three million alone to neighboring Colombia and Brazil, introducing new security concerns for these neighbors. Hyper-inflation is rampant with a worthless currency. There are severe shortages of food. Despite having the largest proved oil and gas reserves of any nation in the world, Venezuela and its refineries are so inefficient that it has been suffering extended power outages. It’s not likely that the Russians can solve these problems, even with their background as a major world energy exporter. U.S. President Donald Trump, Secretary of State Mike Pompeo and National Security Advisor John Bolton, have all declared – in one way or another – that Russia must get out of the country. Meanwhile, Vice President Mike Pence announced new sanctions on the state-owned oil company PDVSA as well as two additional companies that supply Venezuelan crude to Cuba with swap arrangements with Russia. Bolton reiterated the old outlines of the more than 200-year-old Monroe Doctrine which ruled out further European colonization of the Americas, and announced Washington suzerainty over the Western Hemisphere — if not in that many words. “…the United States should lead a more concerted effort to thicken the political bonds and operational ties between NATO and its global partners,” said the Atlantic Council’s Damon Wilson, endorsing a similar suggestion in testimony before a subcommittee of the House Foreign Affairs Committee. Still, Frederick Kempe, president and chief executive officer of the Atlantic Council, has said Venezuela could be the right place to catalyze deeper links among the United States, Canada, key European allies and other leading democracies.